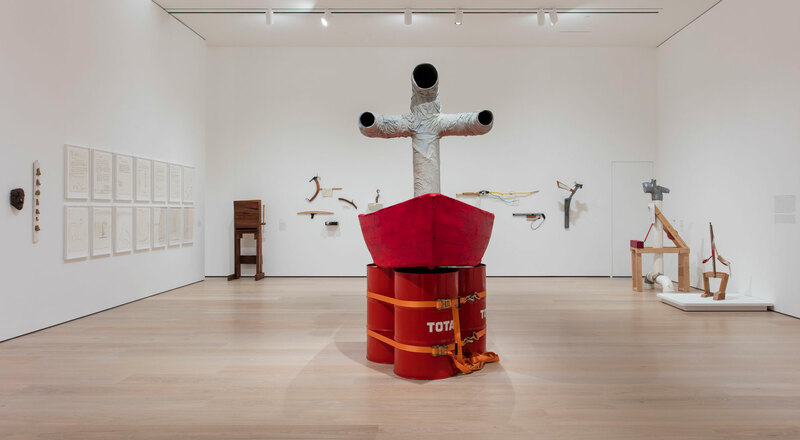 The much-anticipated first North American retrospective of this compelling, inventive, and complex visual artist, performer, poet, essayist, and activist. 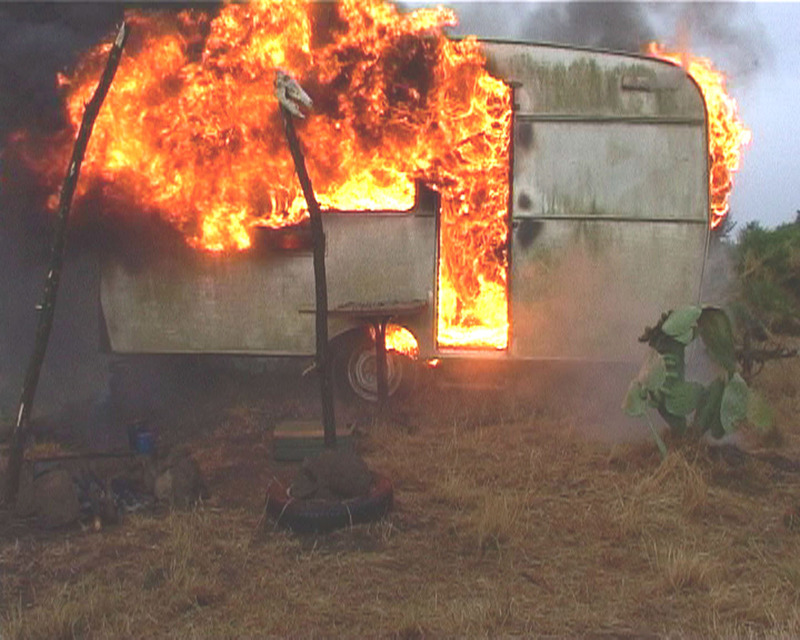 Artist, performer, poet, essayist, and activist Jimmie Durham (b. 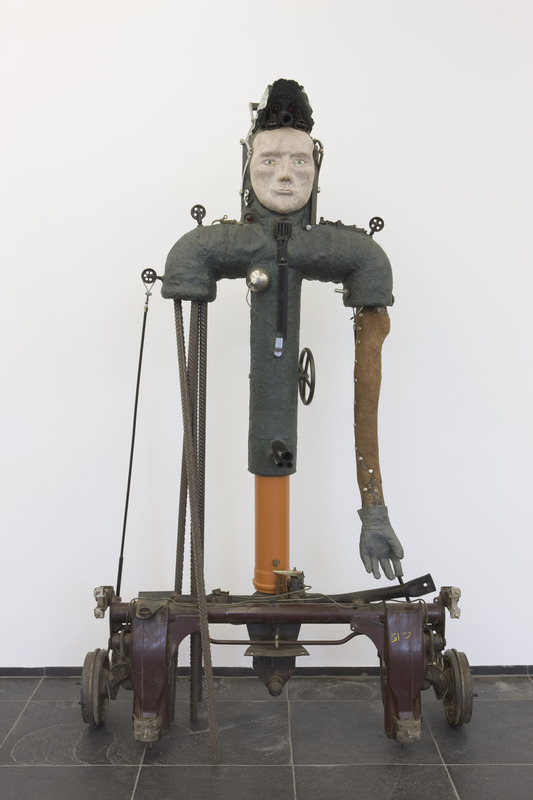 1940, Washington, Arkansas) is one of the most compelling, inventive, and multifaceted artists working internationally today. For American audiences, however, he has been an elusive figure. 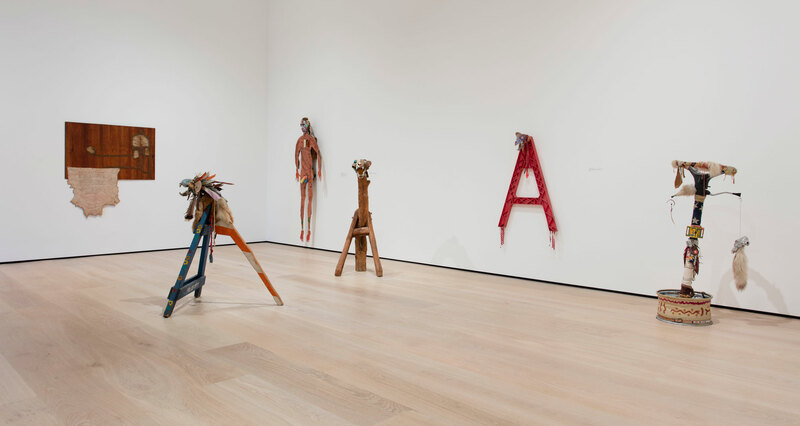 After studying art in Geneva and working for the American Indian Movement for several years, Durham became an active participant in the vibrant New York City downtown art scene in the 1980s. 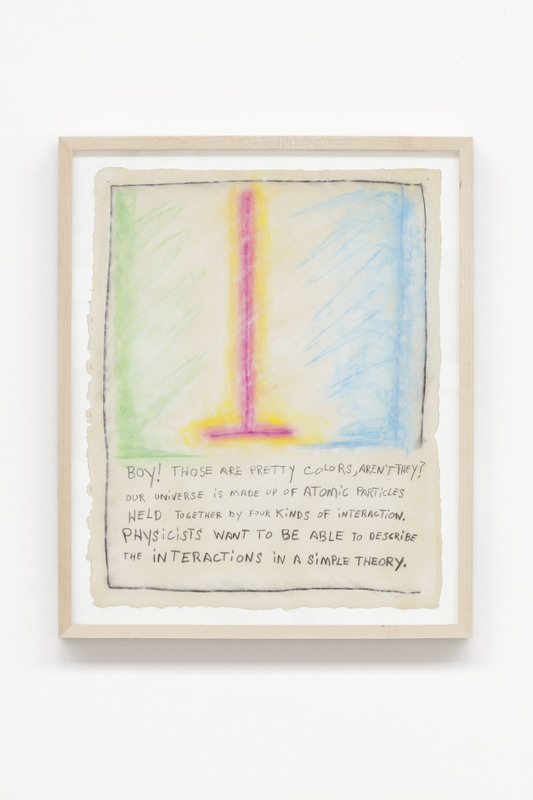 There, he staged solo exhibitions and participated in group shows at such noteworthy nonprofit venues as Artists Space, Exit Art, and Judson Memorial Church. 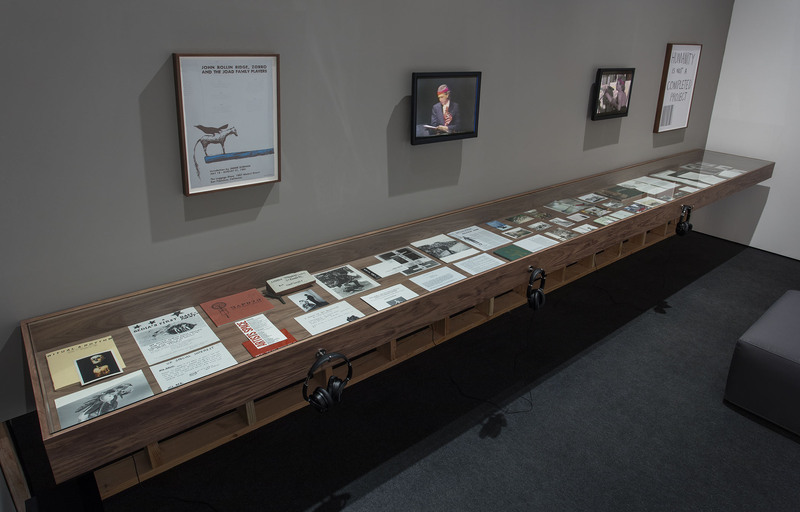 Many of these early exhibitions sought to bring visibility to artists of color or were organized around the most urgent political concerns of the day, including racism, Apartheid, and the US government’s intervention into Central America. 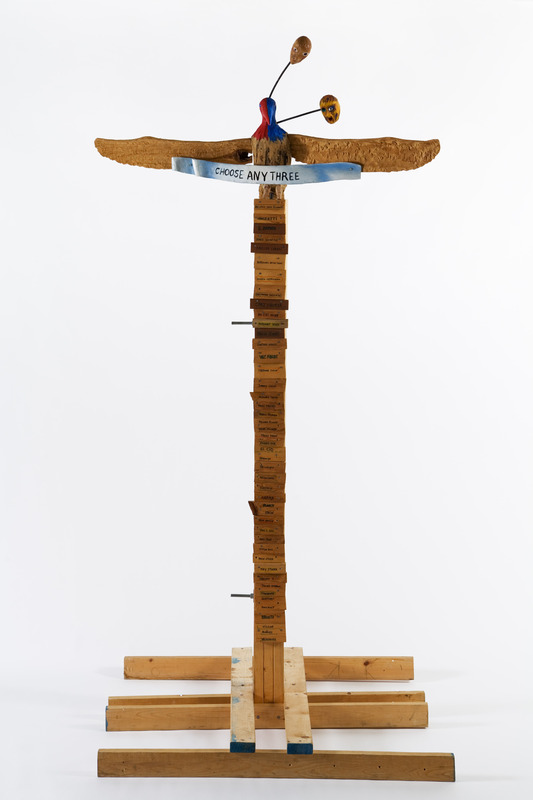 Durham was also a committed advocate for other artists through his role as executive director of the Foundation of the Community of Artists, where he helped edit the newspaper Art and Artists, and as a curator and writer. 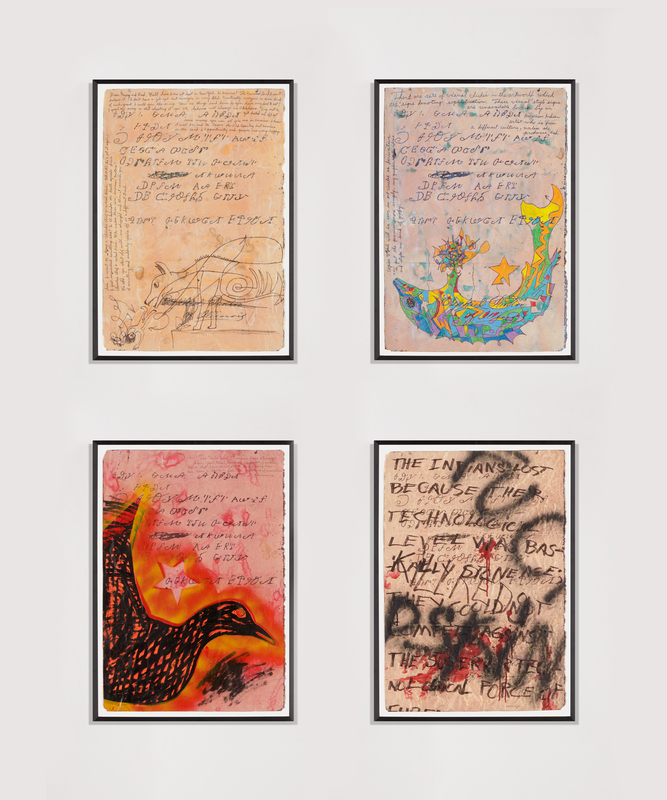 In 1987 Durham chose to leave the United States with his partner, artist Maria Thereza Alves, moving first to Cuernavaca, Mexico, and then to Europe, where they have lived since 1994. 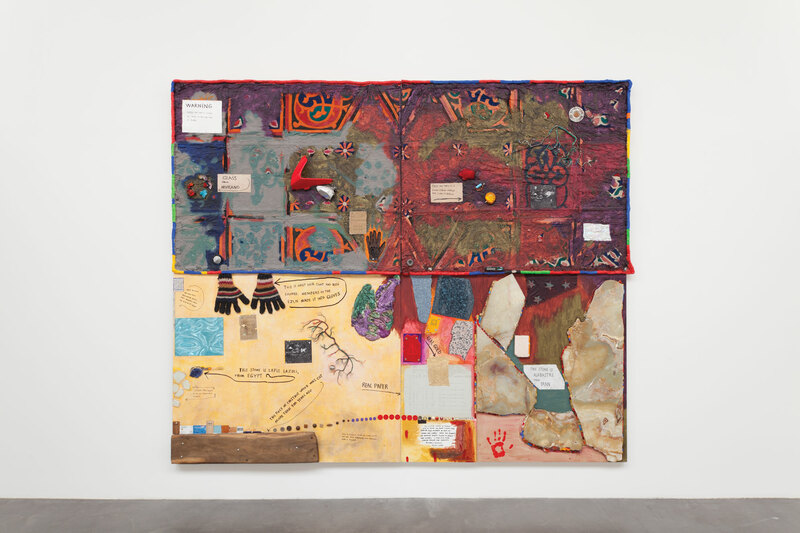 While in Cuernavaca, he returned regularly to the States and continued to participate in the American contemporary art community as an artist, writer, and curator, including participating in the landmark 1993 Whitney Biennial and the New Museum’s 1991 exhibition The Interrupted Life. 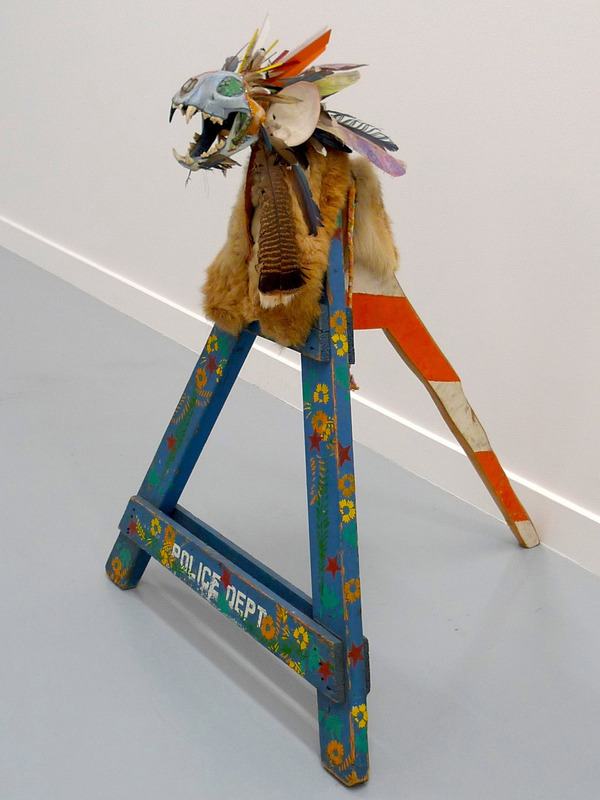 In 1989 his major solo show The Bishop’s Moose and the Pinkerton Men was presented at Exit Art, New York, and traveled to Washington State and Quebec. 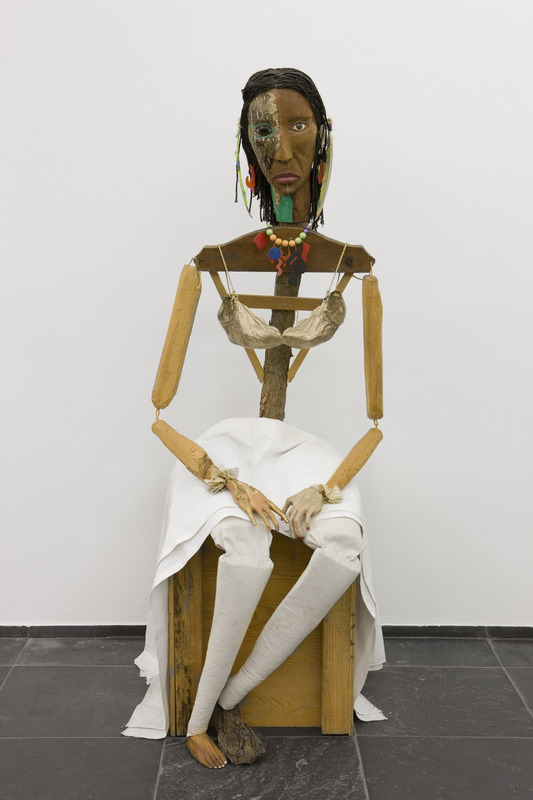 At this time, his work was also being recognized in Europe and Mexico; he was included in Documenta IX in 1992 and his solo show Original Re-Runs (aka, A Certain Lack of Coherence) traveled in Europe throughout 1993 and 1994. 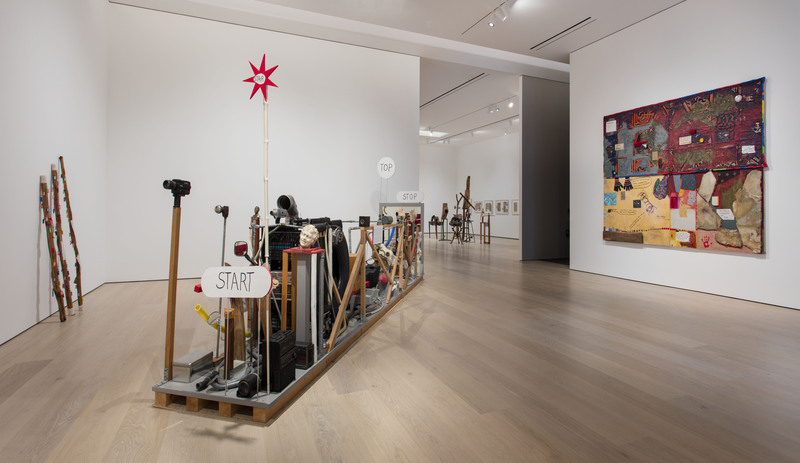 Since moving to Europe more than twenty years ago, however, Durham has largely chosen not to exhibit his work in the United States. The artist’s reasons for this are numerous and understandable on many levels—at once personal, political, and practical. 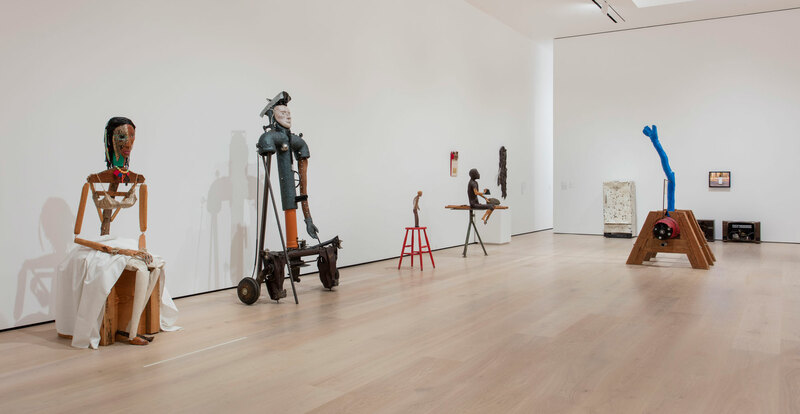 Even so, his work is meaningfully, and indeed crucially, connected to important activities, movements, and genres of American artistic production—sculptural assemblage using found objects, appropriation of existing text and image, institutional critique, the politics of representation, performance—and, moreover, to the colonial history and political struggles of the country. 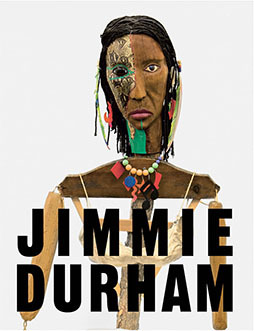 Durham was a significant figure within efforts during the 1980s and 1990s to broaden the canon of art to recognize the work of women and artists of color, while remaining ever cognizant of the marginalization of artists that endeavors such as multiculturalism and categories like “identity politics” engendered. 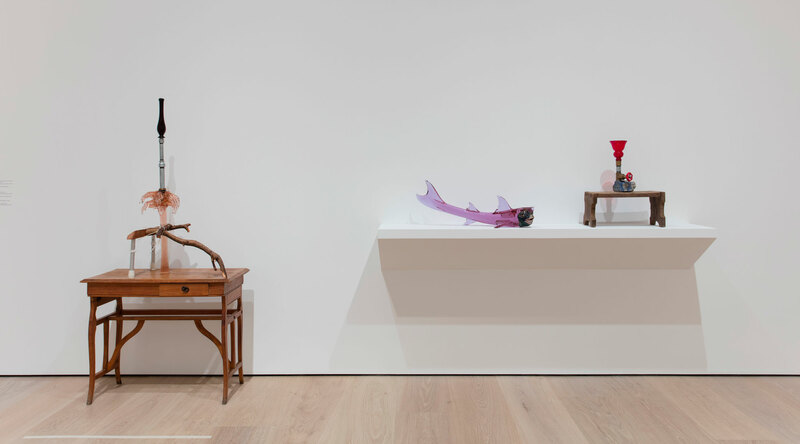 As this period in American art becomes increasingly historicized, Durham’s lack of visibility here risks his work being overlooked in historical exhibitions, museum collections, and the accompanying critical discourse. 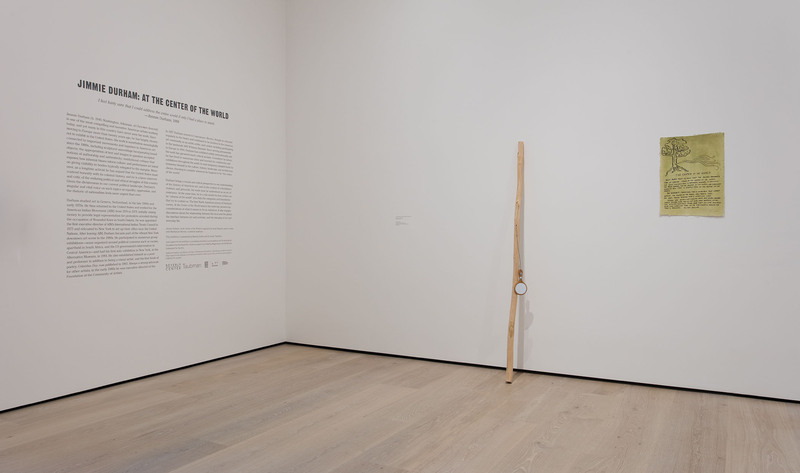 As a singular and vital voice, both as an artist and as an activist, on such topics as colonization, genocide, exile, statehood, and the politics of subjectivity, Durham brings a crucial perspective to an understanding of the history of American art as well as the importance for American artists to be “citizens of the world” and to participate on an international playing field. 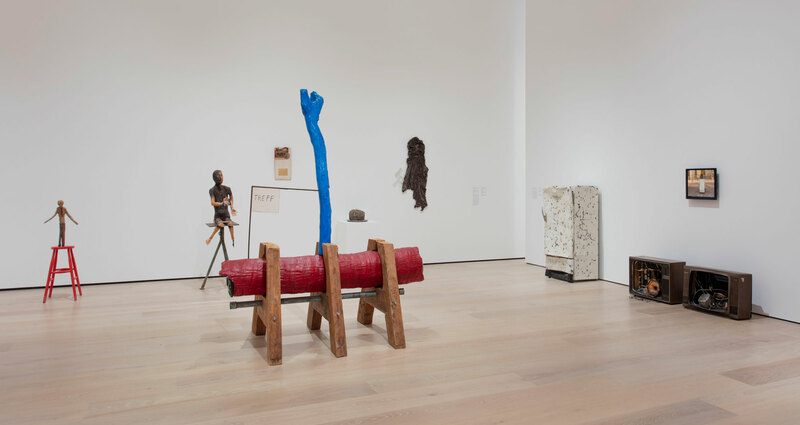 The first retrospective of Durham’s work to take place in North America, At the Center of the World reinserts a consideration of his career into present-day discussions about the interplay between the local and the global, the interface between art and activism, and the history of sculpture as a medium tactically and conceptually entwined with everyday life. 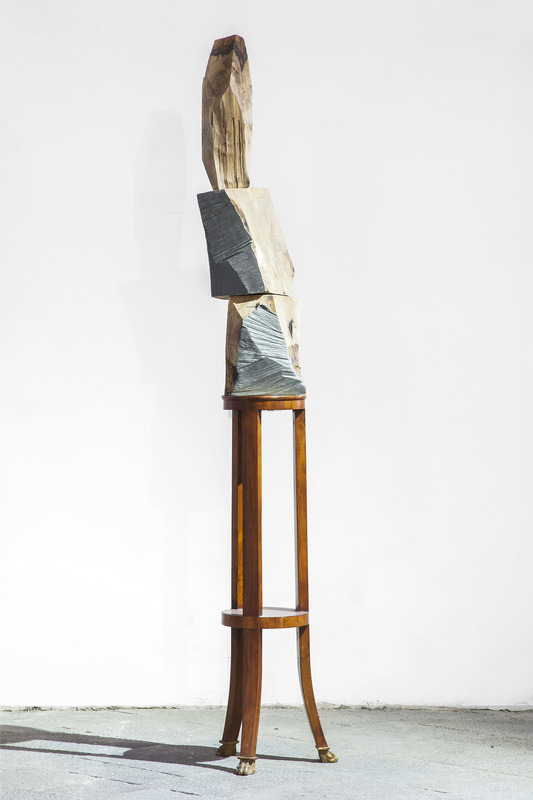 At the core of Durham’s practice is process-driven sculptural assemblage, which can take the form of a small wall relief, a human-scale freestanding sculpture, or a room-size installation. 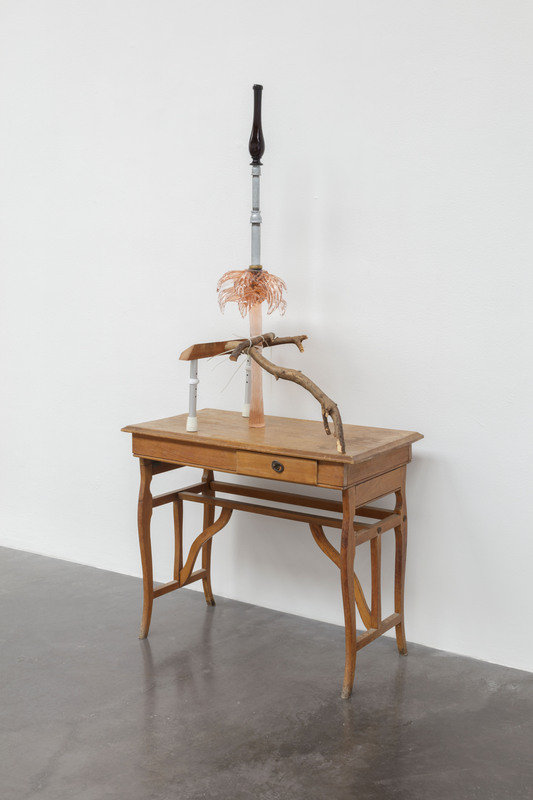 Combining natural elements with manufactured objects, much of it discarded or found and reanimated by the artist, the works question ingrained hierarchies of materials and mediums as well as the modernist preoccupation with originality and artistic heroicism. 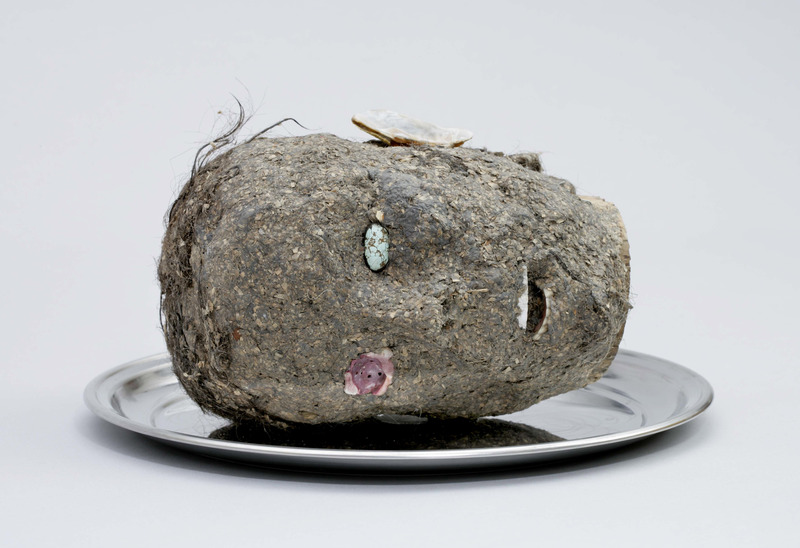 For Durham, a rock, a piece of driftwood, a dirty shirt, a car bumper, a heap of trash, or a moose skull found in a dumpster are all equally fertile objects to incorporate into his work. He is remarkably attentive to form and the specificity of material choices—always knowing a great deal about not just the physical characteristics of his materials but also their botanic, geographic, and even economic histories. 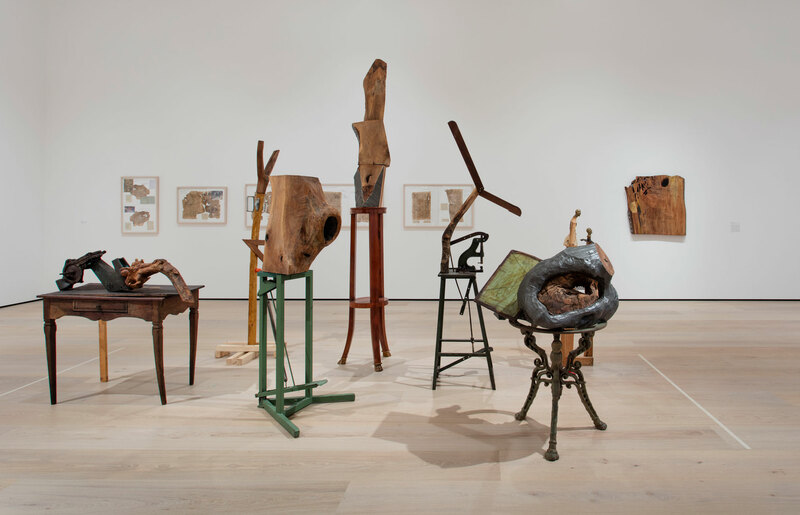 His insatiable curiosity and natural adeptness with materials have led over time to an expansive practice—spanning sculpture, drawing, collage, printmaking, painting, photography, video, performance, and poetry. 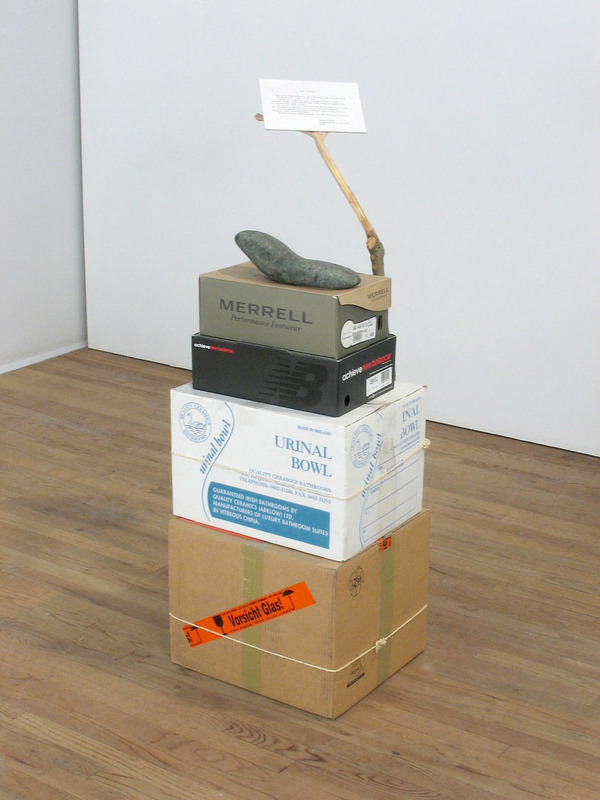 Indeed, he has long combined texts with objects, putting language and materials into energetic interplay, suggesting possible meanings while also elucidating the limitations of language to describe our experiences and pointing to the use of linguistic rhetoric historically to misconstrue, make false promises, or oppress. 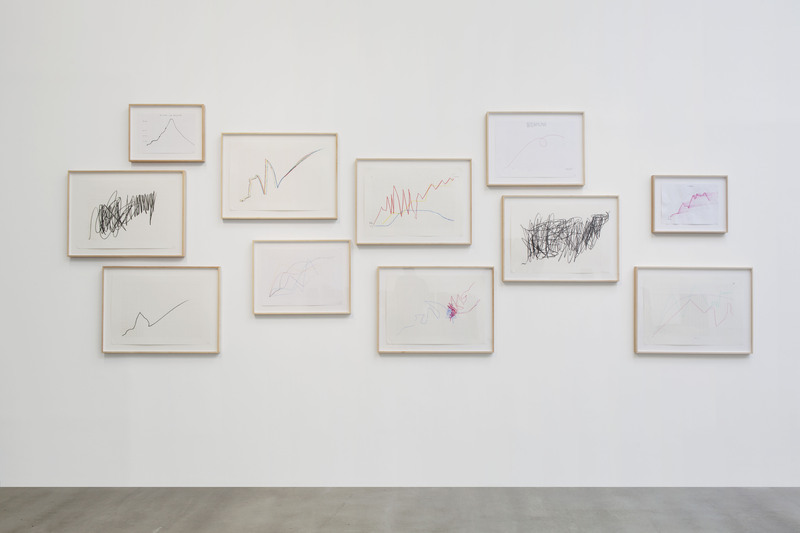 Durham is committed to philosophical and critical inquiry, and positions his art in opposition to categorization, monumentality, and what he sees as corrupt systems of belief. Wit and humor are wielded strategically and with great deftness, serving on the one hand to interrupt, disrupt, and curtail the mainstream and on the other to provide a portal through which visitors can enter into difficult and at times deeply troubling and historically buried subject matter. With close to 200 objects dating from 1970 to the present and accompanied by a catalogue comprising several scholarly essays, an interview with the artist, a chronology, and a selection of his own writings, both old and new, the exhibition traces Durham’s ongoing use of materials such as bone, stone, and wood while also demonstrating his commitment to shedding light on the complexities of historical narratives, notions of authenticity, and the borders and boundaries that try to contain us. Durham’s life and career are remarkable, in part, for his embrace of a particular type of “homelessness,” one that has led him to live and work in numerous places. While many would feel unmoored and disoriented by this constant relocation, for Durham, it is his natural state, as he immerses himself in the culture, history, and culinary habits of each temporary adopted home, always choosing to consider wherever he happens to be “the center of the world.” Durham is arguably one of the most important artists working actively in the international contemporary art scene today, and At the Center of the World provides a much-anticipated opportunity for audiences to gain a deeper understanding of, or perhaps encounter for the first time, the richly rewarding work of this complex, absorbing, and peripatetic artist. 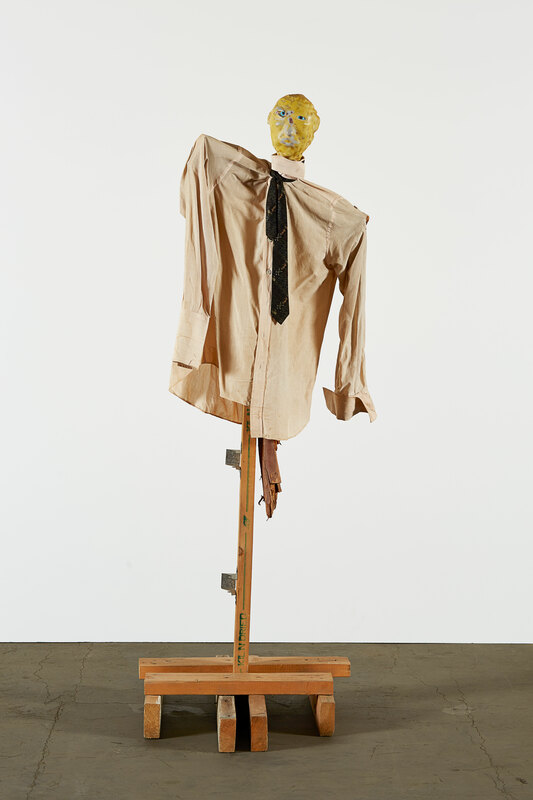 Jimmie Durham was born in Washington, Arkansas, in 1940. 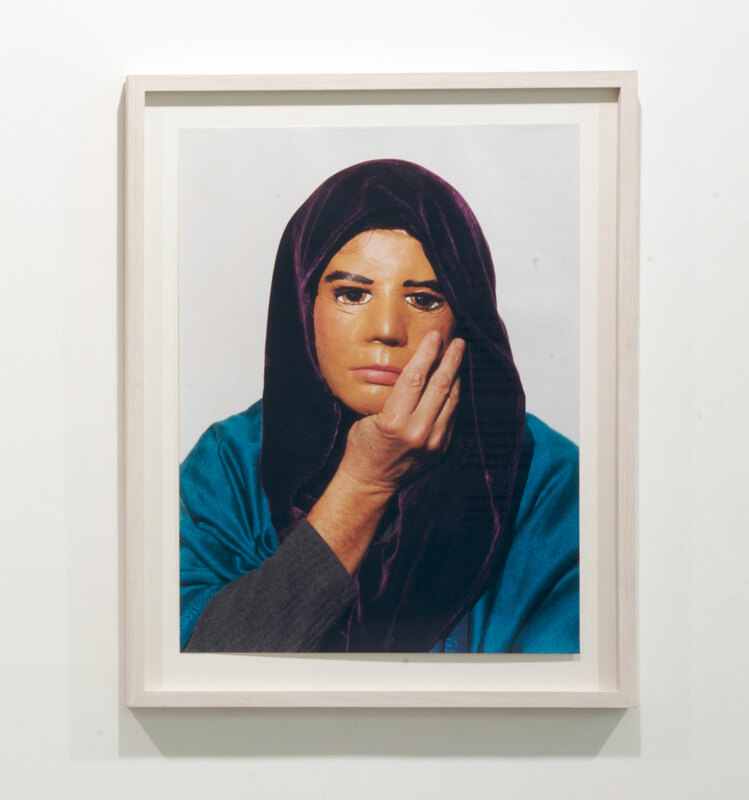 In 1968 he enrolled at L’École des Beaux-Arts in Geneva, where he worked primarily in performance and sculpture. 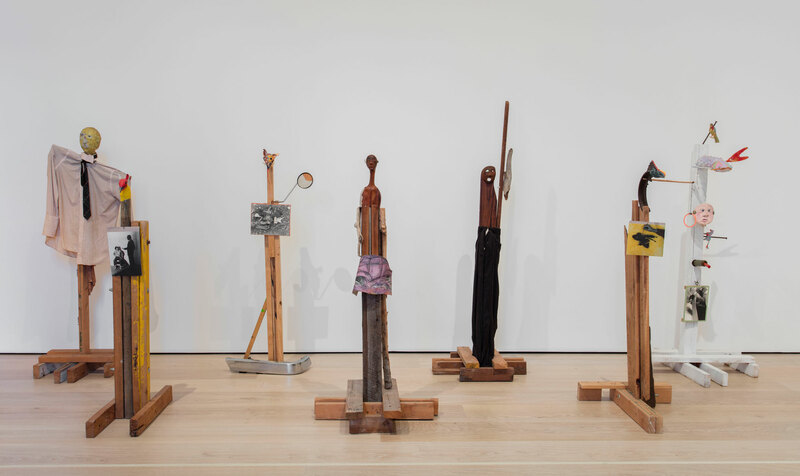 With three other artists, he formed the Draga group, which explored ways to integrate art into public life. At this time, he formed an organization with indigenous friends from South American called Incomindios, which attempted to coordinate and encourage support for the struggle of Indians of the Americas. A lifelong activist, in 1973 he returned to the United States to participate in the occupation at Wounded Knee, in South Dakota, and became a full-time organizer for the American Indian Movement (AIM); he would become a member of their Central Council in 1975. That same year he became the executive director of the International Indian Treaty Council (IITC) in New York City and was made the representative of American Indians to the United Nations, the first minority group to have official representation within the organization. From 1975 to 1980, he was the coeditor of the Treaty Council News, a monthly newspaper of the IITC, and edited the second edition of the Chronicles of American Indian Protest in 1976, published by the Council on Interracial Books for Children. 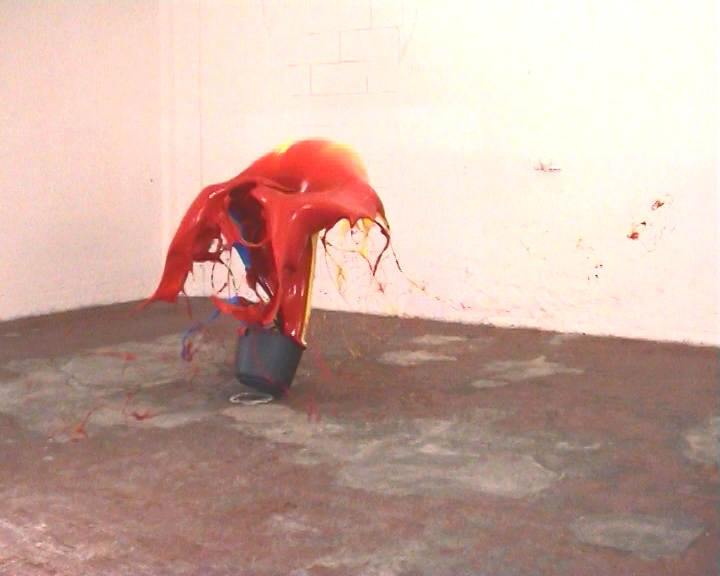 In 1980 he quit AIM and returned to a focus on art making. 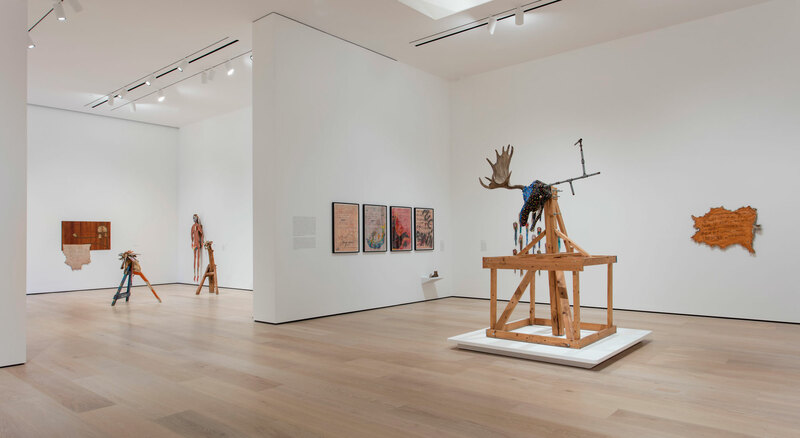 Throughout this decade his work addressed questions of identity, modes of representation, and colonial violence and genocide, specifically related to the experiences of indigenous peoples in the Americas. He was the director of the Foundation for the Community of Artists in New York City from 1981 to 1983, and from 1982 to 1985 edited their monthly Art and Artists Newspaper (formerly Artworkers News). In 1987 Durham moved to Cuernavaca, Mexico, and in 1994 immigrated to Europe. He has lived in Dublin, Brussels, Marseille, and Rome, and currently splits his time between Berlin and Naples. 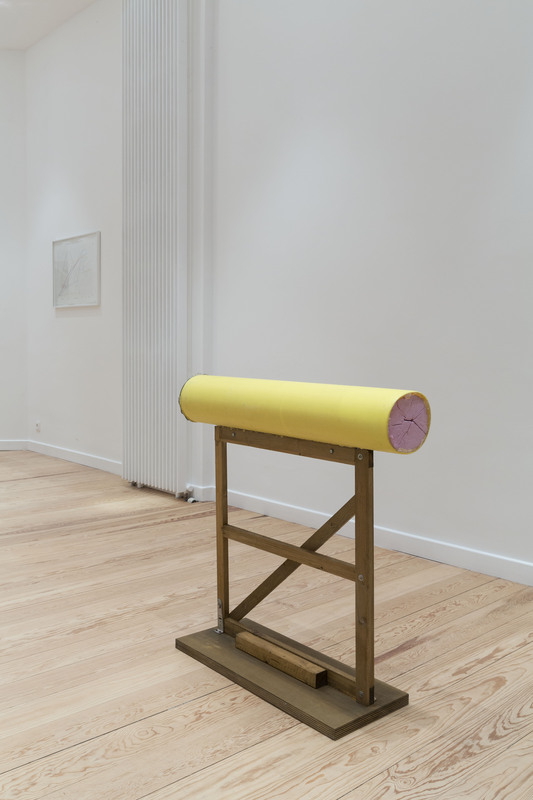 Since moving to Europe, his work has been less explicitly about his personal experiences or background and has addressed cultural politics more broadly, returning to subjects such as language and translation, monumentality, history, and ideology. 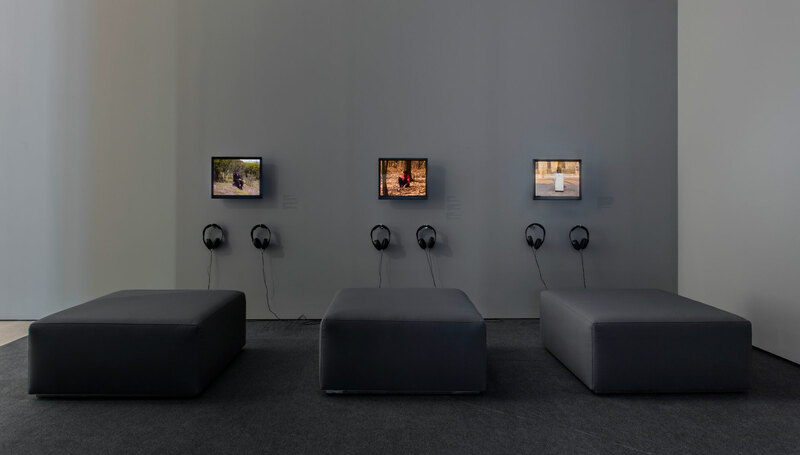 During this time, Durham has repeatedly scrutinized two aspects he considers to be at the heart of European tradition: architecture and belief systems. Durham has professed a desire to remain “homeless,” living everywhere and nowhere simultaneously. 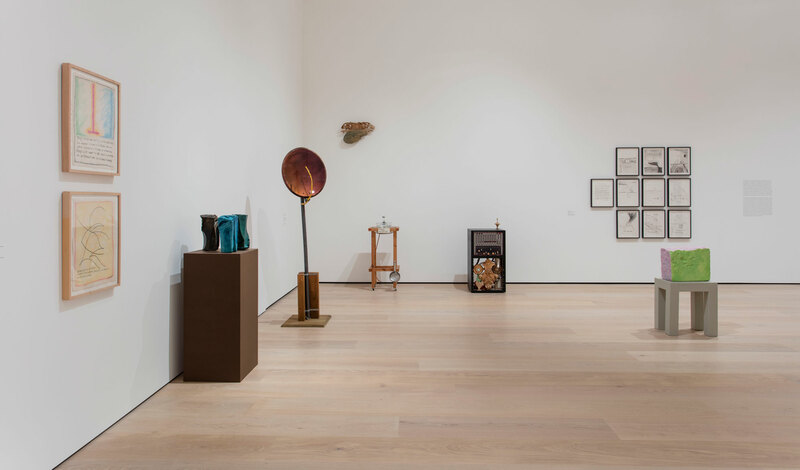 Durham’s exhibition history spans several decades and continents. 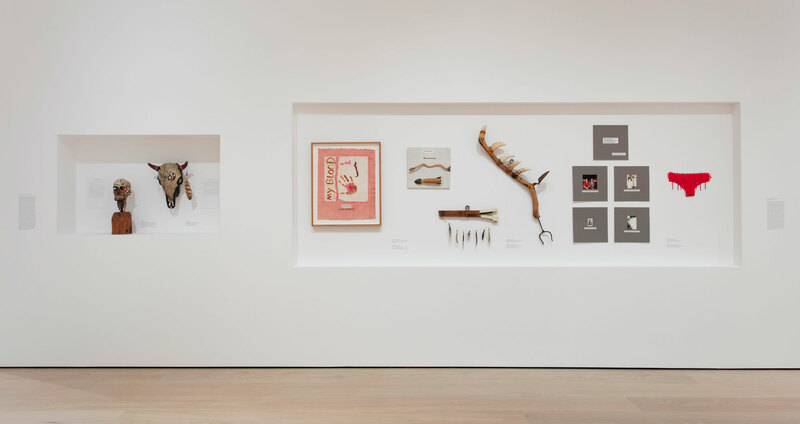 Recent solo exhibitions include Here at the Center, Neuer Berliner Kunstverein, Berlin (2015); Venice: Objects, Work and Tourism, Fondazione Querini Stampalia, Venice (2015); and Various Items and Complaints, Serpentine Gallery, London (2015). 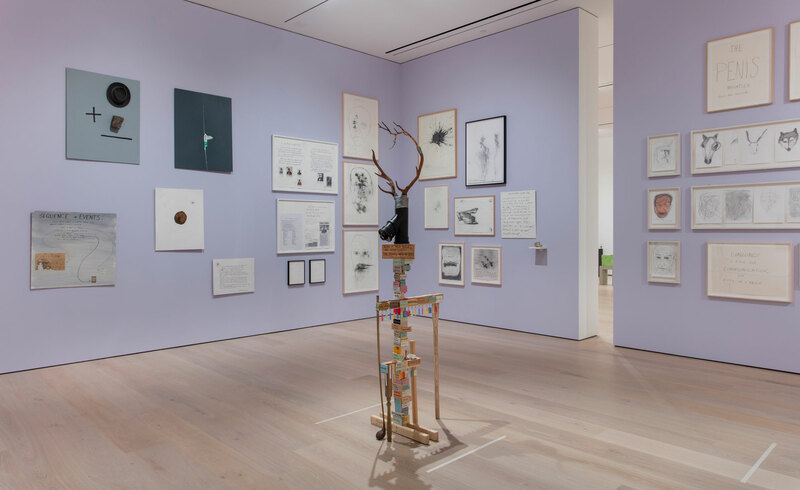 Group shows include Take It or Leave It: Institution, Image, Ideology at the Hammer Museum, Los Angeles (2014); the Whitney Biennial (2014); and Documenta (2012), among many others. 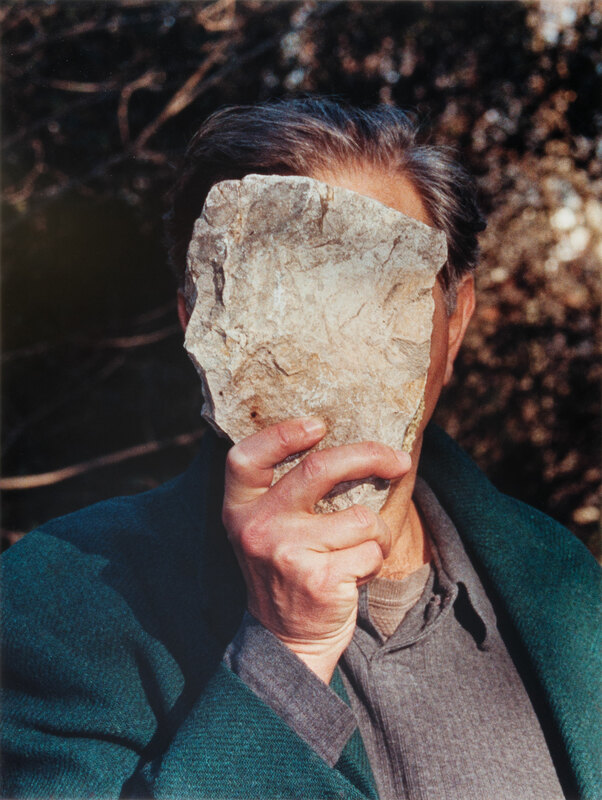 A retrospective of his work—A Matter of Life and Death and Singing—was organized by the Museum van Hedendaagse Kunst, Antwerp (2012), and a survey of his work from 1994 forward, Pierres rejetées... (Rejected stones…), took place at the Musée d’Art Moderne de la Ville de Paris (2009). 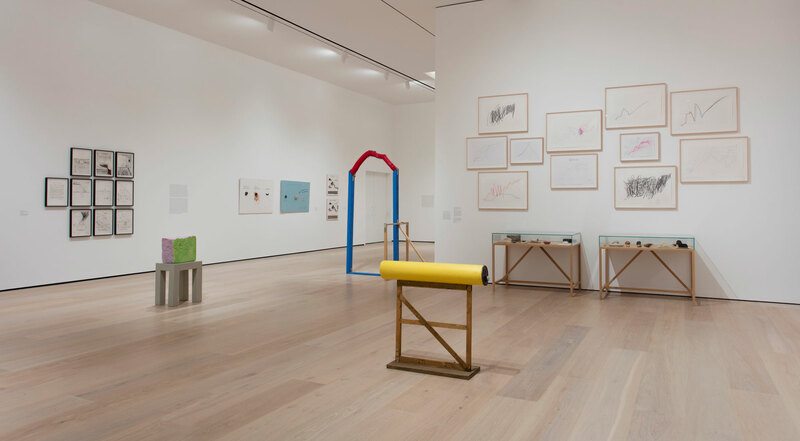 Additional solo exhibitions include Varios y Diversos, Kurimanzutto, Mexico City (2013); Wood, Stone and Friends, Palazzo Reale–Sala Dorica, Fondazione Morra Greco, Naples (2012); Rocks Encouraged, Portikus, Frankfurt (2010); Universal Miniature Golf (The Promised Land), the Glasgow International Festival (2010); Between the Furniture and the Building (Between a Rock and a Hard Place), Kunstverein Munich (1998), among many others. 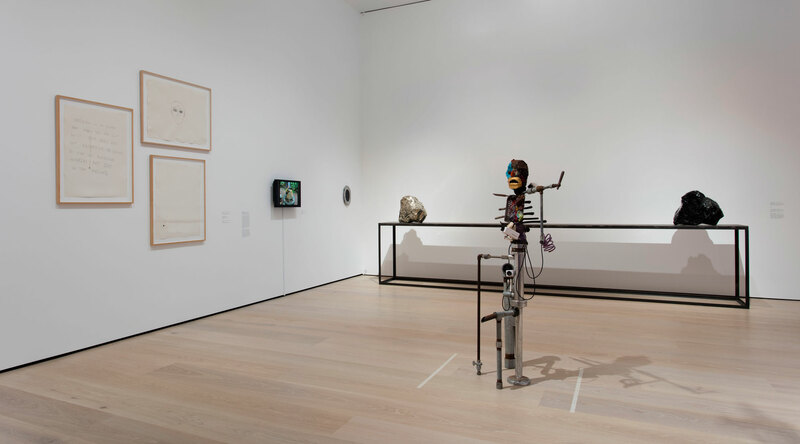 Durham’s works are included in major public collections around the world, including the Hammer Museum, Los Angeles; Walker Art Center, Minneapolis; Museum of Modern Art and Whitney Museum of American Art, New York; Art Institute of Chicago and Museum of Contemporary Art, Chicago; Tate Modern, London; Museum van Hedendaagse Kunst, Antwerp; Stedelijk Museum voor Actuele Kunst, Ghent; Centre Pompidou, Paris; Irish Museum of Modern Art, Dublin; and Museo Jumex, Mexico City, among others. 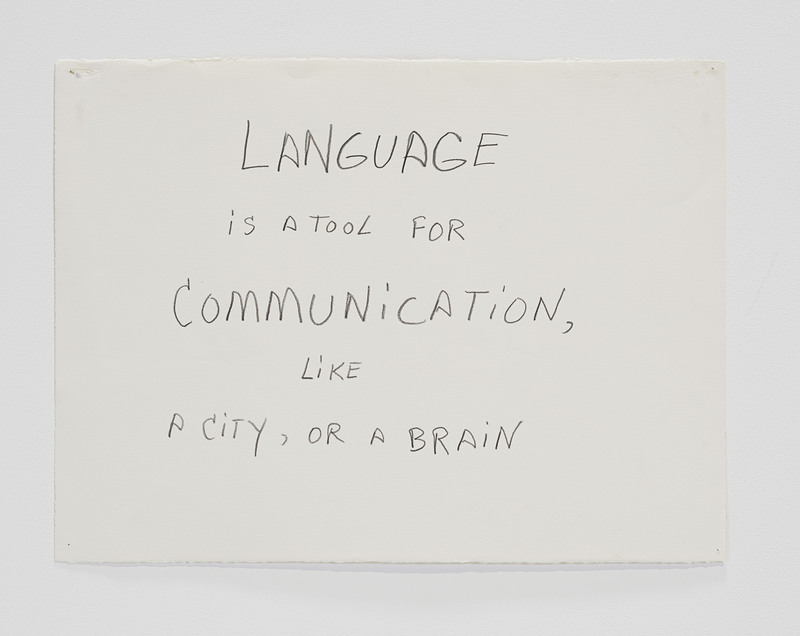 An essayist and poet, Durham has published many texts in journals such as Artforum, Art Journal, and Third Text. His book of poems, Columbus Day, was published in 1983 by West End Press, Minneapolis. His collected essays, A Certain Lack of Coherence, was published in 1993 by Kala Press. 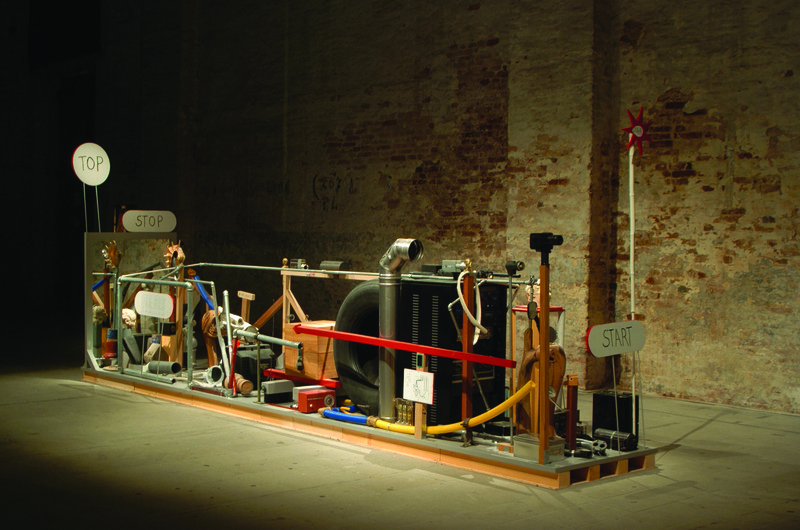 In 2013 Jimmie Durham: Waiting to Be Interrupted, Selected Writings 1993–2012 was published by Mousse Publishing and Museum van Hedendaagse Kunst, Antwerp (with a Spanish translation forthcoming), and his book of poetry Poems That Do Not Go Together was published by Edition Hansjörg Maye. 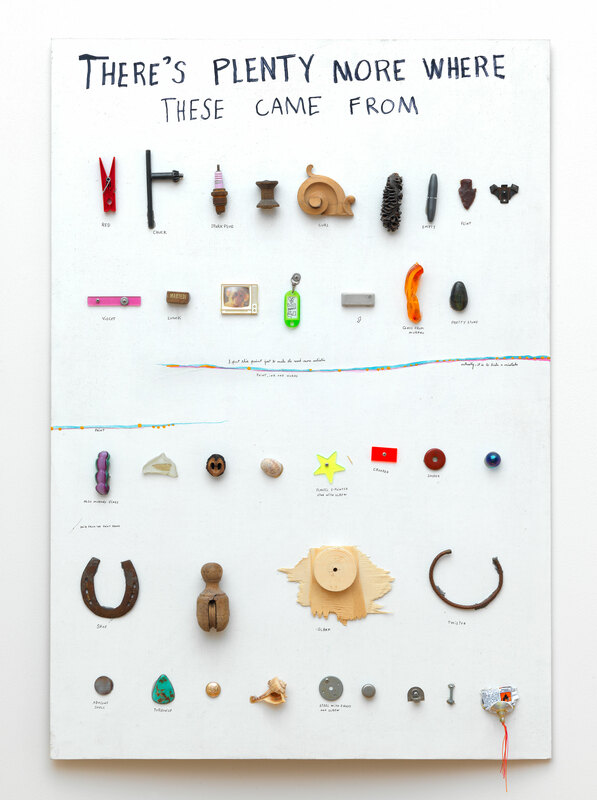 Jimmie Durham: At the Center of the World is organized by Anne Ellegood, senior curator, with MacKenzie Stevens, curatorial assistant. 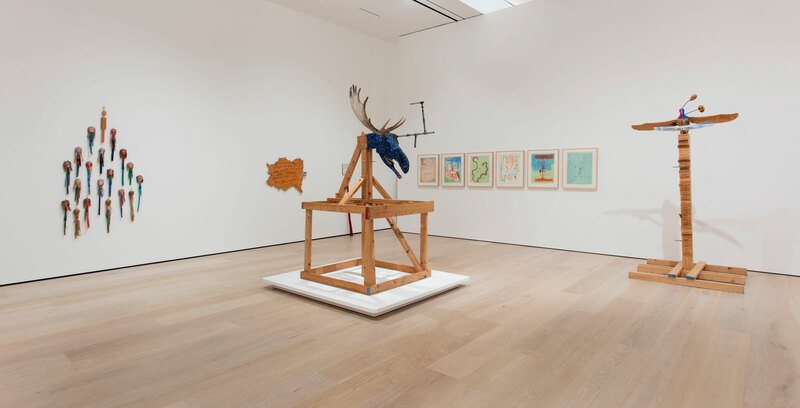 Jimmie Durham: At the Center of the World is presented by Beverly Center and its owner Taubman. Lead support for the exhibition is provided by the Henry Luce Foundation and The Andy Warhol Foundation for the Visual Arts. Generous support is provided by Maggie Kayne and the National Endowment for the Arts. Additional funding is provided by Lonti Ebers, The Ampersand Foundation / Jack Kirkland, and Adam Lindemann. 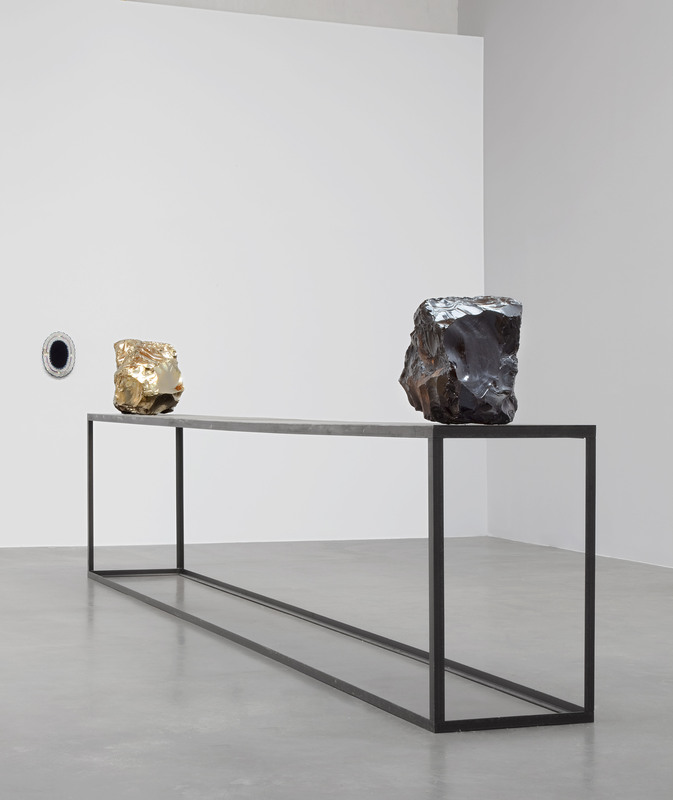 Major support for the catalogue is provided by kurimanzutto. Media sponsorship is provided by Cultured magazine, KCRW 89.9 FM, and KCET.